Whether it's our biodiversity or our economic wealth, we are always unhappy with what we've got and believe the best way to grow and improve is by looking to America and the European Union. India has one of the largest cattle populations in the world -- around 300 million. 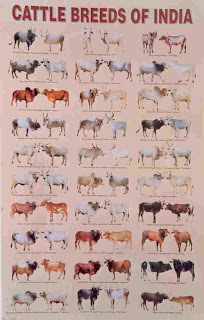 But of the 27 breeds that once existed, we have lost half. Over 80% of our cows are nondescript because of indiscriminate crossbreeding; we simply don't know what breed they belong to. We are the top milk-producing nation in the world, yielding around 81 million tonnes of milk every year. America is Number 2. The official explanation for our success in this field is that we brought in high-yielding milk cows from outside, and crossed them with local cows. But are Indian cows really so unproductive? Take, for example, a breed called Tharparkar, from Rajasthan. As the name suggests -- Thar Par Kar -- the animal is able to walk across the entire Thardesert. Try getting the Jersey cow or the Holstein Friesian to walk one kilometre, and you'll know what I mean! For the Gujjar and Bakerwal communities that live in the Himalayan belt, the loss of native sheep species has been irreplaceable. Over the years, exotic breeds -- mainly Marino sheep imported from Australia to enhance wool and mutton production -- have replaced the traditional breeds that had adapted well to the harsh mountain environment. Now, around 40 years after the import of foreign livestock, we are slowly realising the folly of the whole exercise. According to the Srinagar-based Tribal Research and Cultural Foundation, these exotic breeds have not been able to yield the desired results as they cannot withstand the extreme weather and socio-economic conditions. Some traditional species of sheep and goat have already become extinct. Studies show that sheep breeds like Ghidord, Phamphri, Punchi Bakerwali, Bani and Karnahi have disappeared, while goat species like Guziya, Belori, Lamdi and Goodri are on the brink of extinction. In all, around 12 species of sheep and goat have vanished. For a country that prides itself on being the third largest biodiversity region in the world, this complete lack of respect for traditional animal breeds is unpardonable. For some reason we believe that our animal genetic resources are non-productive and inefficient and are constantly on the lookout to import exotic breeds, whether it be sheep, goats, cows, rabbits, horses, camels or even donkeys. India never tires of praising its amazing biodiversity: apparently we have 81,000 animal species in the country. One species we are richly endowed with is the cow. But it's only during times of worship that we actually remember the cow; the rest of the time we regard it as a useless animal. Its productivity is so low that we believe it can at best give us between 250 gm to 500 gm of milk, and the only way to increase milk production is to bring in Holstein Friesian or Jersey cows from outside and crossbreed them with local breeds. For 40-50 years we've considered our cows useless. India undertook a massive programme to mass crossbreed its cows. We have 27 breeds of wonderful cattle in this country. How did they all suddenly become so unproductive? Dr M S Randhawa's four volumes of History of Indian Agriculture reveal that our ancient kings revered cattle and appreciated the role they played. For instance, the Vaichur, one of the smallest breeds of cattle in the world, which has now practically disappeared from this part of the world, requires only around 2 kg of feed a day. The breed can be found today at Reading University in England. Isn't it strange that cattle breeds are disappearing from our country only to be kept safe outside the country? In an FAO study that came out some months ago it was reported that Brazil had become the biggest exporter of Indian breeds of cow. Isn't it sad that a country like India, which arguably has the best cattle germplasm in the world, is nowhere, whereas Brazil has become the biggest exporter of our cows! A bit of delving into some history revealed that Brazil had taken around six breeds of cow from India in the early-1960s, primarily for beef production. When the cows landed in Brazil, it was found that they also gave milk. So they were bred for both purposes. Today, of the six original cow breeds, three (the Gir from Gujarat, Kankrej and Ongole from Andhra Pradesh and Tamil Nadu) produce milk equal to Jersey and Holstein Friesian cows. One of these breeds even gives more milk than the two breeds we imported. It would be no surprise if India began importing its own cow breeds back from Brazil! If we had worked on our traditional cow breeds we could have turned the unproductive cows that roam our city streets into high-milk-producing animals that would have ideally fitted in with the integrated farming systems that India had before it adopted Green Revolution technology. It's time we realised the importance of our traditional livestock species and launched a nationwide campaign not only to conserve them but also to harness their economic importance.